Ebola is a highly infectious and deadly disease. Symptoms include fever, sore throat, muscle pain, and headaches, and are followed by vomiting, diarrhea, rash, and internal and external bleeding1. The incubation period is between 2 to 21 days. It is deadly in 50% of the cases (on average). It is transmitted through direct contact with body fluids. There is no cure and patients are given fluids to reduce fever and stabilize blood pressure. The Ebola outbreak in West Africa was first reported in December 2013 in Guinea. It is the deadliest occurrence of the disease since its discovery in 1976. The largest outbreak is centered in Guinea, Liberia, and Sierra Leone. There are numerous examples on how technology is helping containg and fight Ebola – from radio, TV, toll free hotlines to social media, SMS solutions and mobile apps. In this article we provide references that will let readers understand how technology is used to contain and fight Ebola in West Africa. This article provides a list of possible use cases and describes some solutions in details, discusses the limitation of some solutions that do not rely on the users and context of the affected areas, and make some recommendations to consider in developing relevant and efficient solutions. Our conclusion are that: 1) while targeting the general population is crucial, solutions aiming at health workers and community leaders are also important as they can disseminate information; 2) SMS is still the most powerful technology to reach people at risk; and 3) there is a need of more collaborations between the actors who are proposing redundant solutions and not sharing message content and collected data. Up to January 9th 2015, more than 800 people were reported as having died from the disease in six countries: Liberia, Guinea, Sierra Leone, Nigeria, Mali and the US. The total number of reported cases is more than 21,000. Considering the difficulty of collecting data, the World Health Organization (WHO) believes that these figures are underreported2. Finding and counting cases often require investigations on the field and avoiding stressing out and frightening people more than they already are. Cases can fall out of the official count at each step of the reporting process due to mistrust, poverty, lack of resources for health workers, and poor roads and infrastructures. The consequences of the disease are not only linked with health and deaths. The Ebola crisis slows down important services and local economy of affected countries. A UN World Food Programme (WFP) survey found that households in Kailahun and Kenema, two districts in eastern Sierra Leone are badly affected by the Ebola outbreak and struggling to meet their basic food needs3. In addition, more than 5 million children in West Africa cannot attend school and emergency education measures are necessary to support and sustain school safety4,5,6. There are numerous examples on how technology is helping fight Ebola – from radio, TV, toll free hotlines to social media, SMS solutions and mobile apps7,8,9. While we need technology, we can question some uses of technology and high tech solutions that do not consider the realities of the affected countries (e.g., the use of drones and social media)10. Better infrastructures are needed and Facebook, the Paul G. Allen Family Foundation, Cisco, EveryLayer and Inveneo are partnering to improve communications to fight ebola11. It is important to have people and context of the affected countries at the core of the design of the solutions. It is not about technological prowess but technology that works! For example, 69% of people in Sierra Leone have mobile phones, but only 9% used 3G data. It is clear that mobile phones have a more important role to play than any other technology but mobile penetration is still low in rural and remote areas. What solutions to propose where Internet penetration and literacy are low, use of smartphones is almost inexistent, rural areas are not covered by telecom operators, and people speak local languages different from English and French and do not use social media? SMS is a powerful tool as it is available on every type of phone and people in the affected areas are still using basic phones without Internet access. SMS can be saved on phones and can be shared easily by people and health workers. However, they require literacy! Most SMS systems are only one-way, so they cannot be used to collect information directly from the general population or target group. More two-way communications are necessary. There are more than 200 apps on Google Play that target Ebola12. We can categorize them as follows: emergency/disaster management, prevention, support for victims and survivors, tracking, and data collection. Their targets can be the general population and health workers. Considering the status of apps penetration in West Africa, apps for health workers would have more impact providing health workers are trained and equipped with smartphones. The quality of the content of SMS and apps is very important. Content needs to be up-to-date, synchronized and developed with experts. There are more than 200 initiatives by NGOs and international organizations in the design of messages about Ebola to be sent to communities. This certainly implies replication of the same content and spamming targeted people. It is important for organizations to work together and design a database of Ebola messages as it was done for MAMA in maternal health13. The use of Social Media is still limited in Africa. Facebook is the most widely used social network. The diaspora has an important role to play on social media in crisis situations by relaying crucial information to relatives in the affected areas10,14. Collecting and analyzing data and mapping the disease are crucial. The US company, Magpi (http://home.magpi.com), is helping to change the way data are collected and analyzed by implementing mobile data solutions in affected areas. More generally, it is important that all data related to Ebola are made available to researchers, organizations and developers to analyze and propose solutions to contain the disease15. OpenStreetMap has been providing crowdsourced mapping services from the beginning of the Ebola outbreak16. Maps of the spread of the diseases, available health facilities, hostility towards health workers and other information are provided. OpenStreetMap permits a low granularity of information and maps areas that are not available on Google Maps. The International Federation of Red Cross and Red Crescent Societies (IFRC) have partnered with Airtel and the Sierra Leone government to send health reminders via SMS using the Trilogy Emergency Relief Application (TERA). TERA permits to specify the areas in which the SMS can be sent. It allows two-way communication and people can send questions to get more information about a topic. More than 2 million free SMS were sent with reminders on seeking treatment early, avoiding physical contact and be cooperative with community health workers. The BBC launched an Ebola public health information service on WhatsApp, the biggest chat app in use in Africa. Audio and SMS alerts and images are sent to provide people with the latest public health information. MIXIT is also used to send public health information. In Liberia, IntraHealth Internationaland UNICEF partnered with the Ministry of Health to connect the iHRIS health workforce information system with mHero (Mobile Health Worker Electronic Response and Outreach). Through mHero the Ministry of Health can broadcast SMS directly to health workers with information about emergency cases and training material. In Sierra Leone, polling is conducted in affected areas by SMS and interactive voice calls to understand the needs of people in affected areas and how to support them better. Using SMS and voice ease and empower the process of collecting data directly from people and repeating the process. 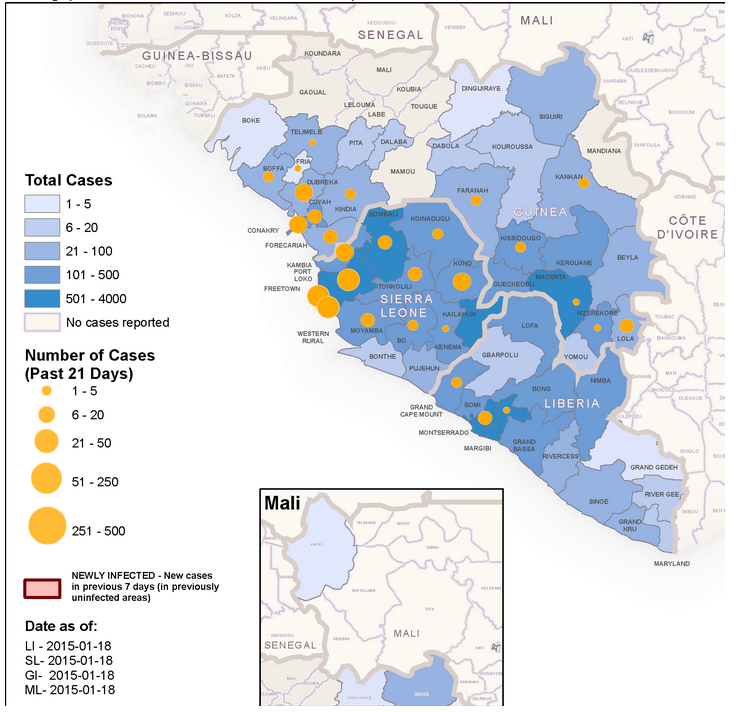 Ebola: Mapping the outbreak. 9 January 2015. According to a study by the government of Sierra Leone, UNICEF and other partners, 96% of the households affected by Ebola are suffering from discrimination. A campaign, called #ISurvivedEbola, was launched to support Ebola survivors in all aspects of their life after the disease. Survivors can submit updates that are directly visible on social media and the dedicated web site. Ebola tracker maps the 2014 Ebola outbreak and permits to know the number of cases that are reported and where the closest Ebola case is. SenStopEbola and Ebola Prevention are apps by local developers from Senegal and Ivory Coast respectively. They raise awareness about the disease and are available in different local languages. Facebook created Safety Check, an app that lets people near the site of a natural disaster to know if their friends are safe. The app is activated in case of disaster or emergency situation. Numerous universities and organizations around the world have organized hackathons where interdisciplinary teams of developers, designers, public health specialists, activists, and medical experts can work together to frame solutions to fight Ebola. One particularly noticeable initiative is targeting youth of Sierra Leone (e.g., secondary school pupils) who are out of school due to the outbreak17.